La Marmotte (along with l'Etape du Tour) are probably the most famous and two of the most challenging Cyclosportives in France. I'll be riding it this Saturday: 174 kilometres and +5,000 metres of ascent (+17,000 feet). 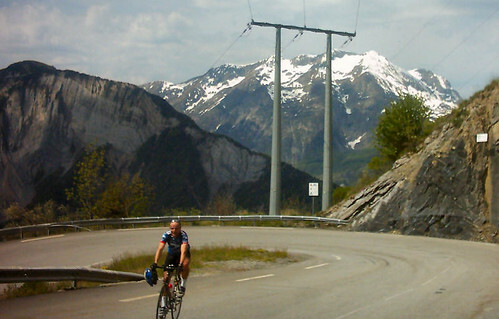 Three epic, beautiful, and legendary climbs with the easiest being Alpe d'Huez (seriously). 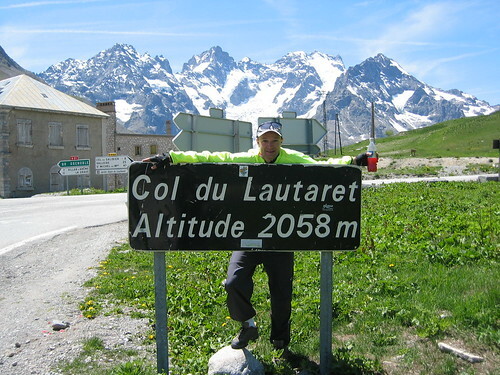 Martin and I are signed up for the 2008 La Marmotte this coming saturday, July 5th. Update: We made it! See here for photos, video and trip report. Saturday’s course: 174 kilometres and +5,000 metres of ascent (+17,000 feet). 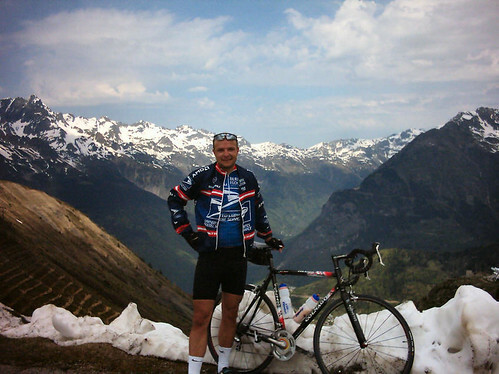 Three epic, beautiful, and legendary climbs with the easiest being Alpe d’Huez (seriously). I don’t know the final count but there should be around 8,000 riders! I am number 5,943. After a few flat kilometres, the first climb will start near Rochetaillée. 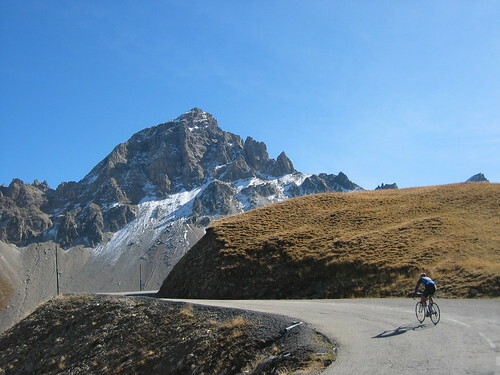 the route will climb most of the classic South side of Croix de Fer. 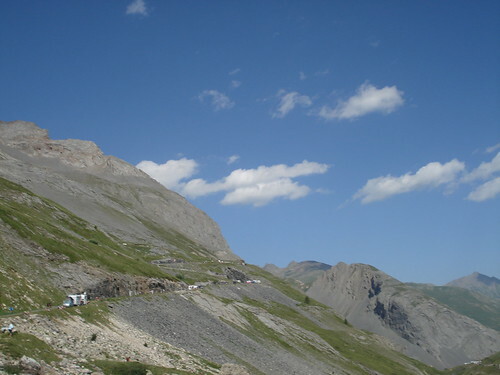 But 2 kilometres from the summit, it will turn left immediately reaching the summit of Col du Glandon. The descent down Glandon will be crowded and extremely fast and it’s a narrow road – careful. There were some serious crashes in 2006 and racers had to be let down 50 at a time. First, one needs to climb Col du Telegraphe (1,566 metres). A pleasant climb through the alpine forest – and a descent challenge in it’s own right. 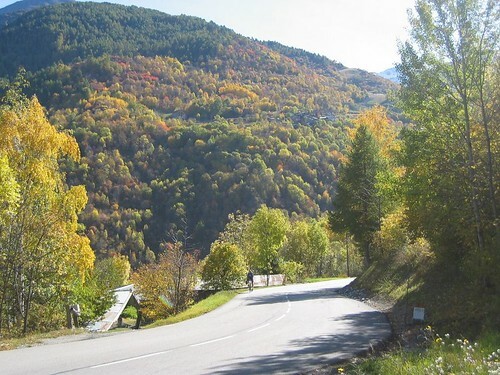 A quick descent to Valloire – the forest disappears and then it’s up, up, and up. The climb literally goes over the mountains. This is such a beautiful ride, remember to try and enjoy it during the suffering. 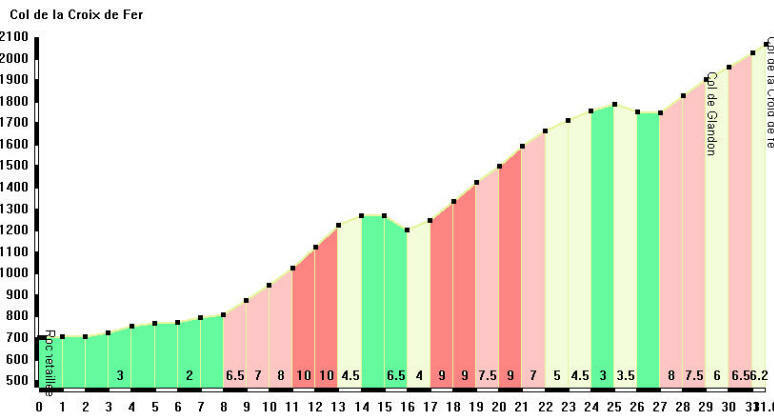 While the top is not excessively steep, the rarefied altitude will significantly add to the difficulty near the end. A truly awesome climb. 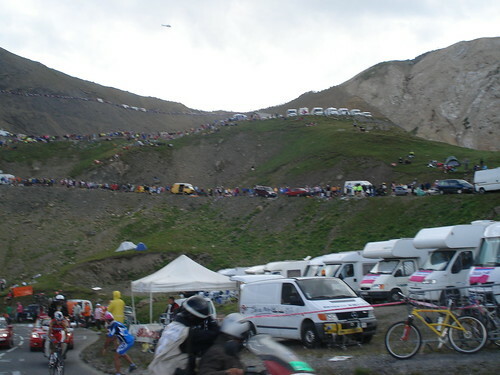 After descending Galibier via Col du Lautaret, you may be exhausted, but you will find yourself at the bottom of Alpe d’Huez and it’s 21 famous hairpins – each named for a former Tour stage winner here. The first two kilometres are very hard, the rest is just hard! Good luck and remember to enjoy the views! To be clear, I don’t expect to finish this course – it’s really beyond my capabilities. And with my bad calf, my priority is not to aggravate the injury before our July Alps Tour. But we’ll see. Next Article La Marmotte 2008 – Success! I have been a regular reader of your blog, super stuff. Very envious of your opportunities to ride all the fabulous cols, but even more admiring of how you are getting out there and doing it. I’m off to do the grandfondo Pinarello on the 20th, and then a week in lombardy and the alps in August. Quick technical question. what GPS are you using? I’m thinking of buying one, as your habit of plotting routes etc appeals to my geek side. I use a Garmin Edge 305 GPS – it’s fantastic. Auto downloads, heart rate, cadence, loads of info, very accurate, etc. Note, Garmin has recently released even fancier versions with the Edge 605 and Edge 705. The data easily uploads to several very good mapping sites – easy to embed into your blog. And as a log book I use http://www.zonefivesoftware.com/SportTracks/ which is the most amazing piece of free software that auto downloads all info from the GPS. La Marmotte is not to be under-estimated. After 5 consecutive L’Etapes, I took a team of 10 down to Alpe d’Huez last year. 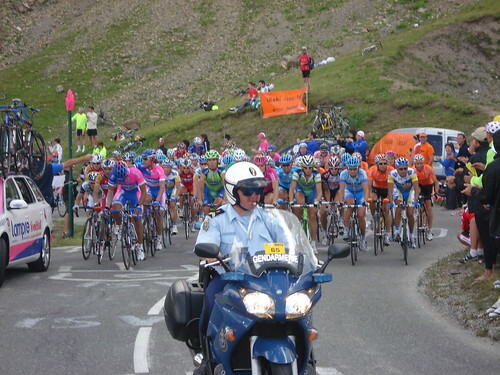 I was riding well, until……………………………….I cramped with 2 km to go on the Galibier. 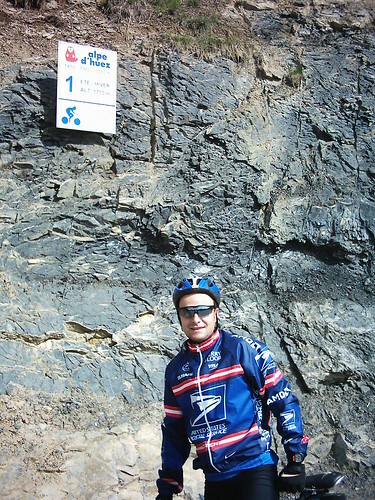 I was basically done for and ‘span’ down to Bourg d’Oisans hoping that my legs would clear. As we all know, there are two Hopes. Bob Hope and No Hope and there was no way I was going to get up the Alpe without doing myself damage. L’Etape went up it the year before and I could remember only too well how tough it is when you’ve done so many kms and so much climbing. So I went and got a coffee and a can of coke and ordered a taxi! Wow–la Marmotte! This is serious stuff, Will. Between the other cyclosportifs and this you will be Rocket Man in July. I just hope your descending hasn’t improved much or else you will be in Nice before the rest of us get to Barcelonnette. Have a great ride: be safe and have fun! and if you ever fancy a ride in the black forest or the Voges, then let me know. 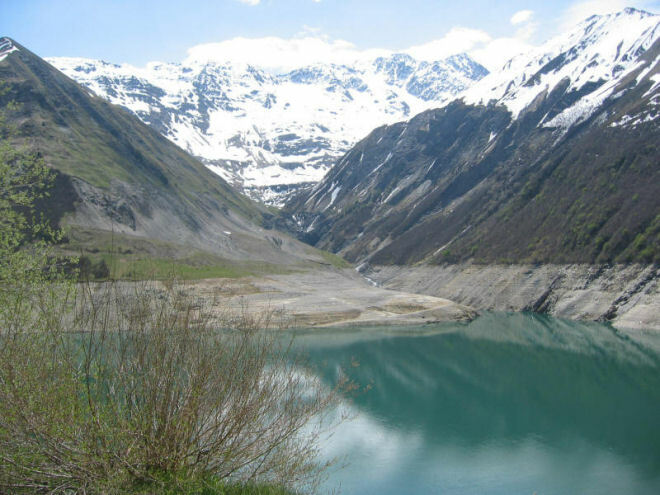 Although not so high as the alps, Grand Balon has so much history, it needs to be on your list. In fact, exactly 12 months ago I spent a great trip in the Vosges including Grand Ballon and the Ballon d’Alsace. I’m in awe of the stuff you’re doing these days — the distances and ascents are so huge!! 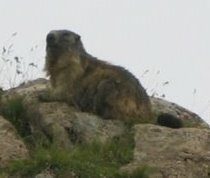 I’ll be waiting on Saturday night to hear about your Marmotte adventures — be safe in the crowds & descending.